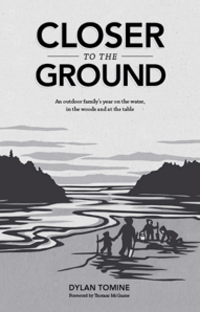 Dylan Tomine is the author of Closer to the Ground: An Outdoor Family’s Year on the Water, in the Woods, and at the Table (2012). The book is a deeply personal story of a father learning to share his love of nature with his children - not through the indoor lens of words or pictures, but directly, by exploring the natural world as they forage, and by cooking and eating from the woods and sea. "Dylan Tomine’s Closer to the Ground is a pleasure to read, depicting as it does the days and seasons of a family intent on living joyfully, and providing at the same time a lively meditation on our relationship to nature. I found its buoyant, irrepressible, self-deprecating tone entirely winning, and was drawn in, happily, from page one." - David Guterson. For more information on Dylan Tomine go to http://www.dylantomine.com/.